Evolutions Medical Spa has been voted Best Medical Spa by Santa Barbara readers of the weekly Independent paper and the Santa Barbara News-Press. This is the third year in a row that Evolutions has been honored by Santa Barbara residents! Available treatments range from non-invasive and minimally invasive medical procedures (performed by aesthetic nurse specialists or Dr. Perkins) such as Botox/Dysport, Dermal Fillers, Laser Vein Removal, Fotofacials, Isolaz Deep Pore Therapy, Stretch Mark Reduction and more. Aesthetic treatments are performed by a medical aesthetician and include Facials, Chemical Peels, Vibradermabrasion, VelaShape, Teeth Whitening and more. See a complete list of services available here. 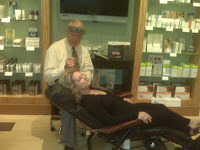 Evolutions also carries top skin care products that are hand picked by Dr. Perkins. Medical grade home care is an important part of achieving and maintaining great skin! Stop by Evolutions to speak to one of our highly-trained staff members and create a customized home care plan to help address your skin-related concerns. Many of the products are also available at Evolutions’ eStore. The team at Evolutions welcomes each and every client personally and insures that the person has a pleasant experience with measurable results. Customer satisfaction is extremely important to us. Winning Best Medical Spa for several years helps to reinforce that our clients love the care and results they receive at Evolutions. Thank you! Last month Evolutions hosted a “Crazy Gorgeous Skin Event” (read the recap about it here) and one lucky client won the Revaleskin products basket! After using the products for four weeks, she has volunteered to blog her experience of Revale with us! Revaleskin products are powerful anti-aging skin care products that are exclusively formulated with CoffeeBerry® extract (coffee berries pictured to the right), a natural super-antioxident. CoffeeBerry® extract boasts one of the highest antioxidant scores ever recorded – rich in polyphenol antioxidants that help fend off the free radicals that cause cell damage and play a part in the aging process. Revaleskin products are a simple 3-step system and contain a daily facial cleanser, a Day Cream with SPF 15 sunscreen and a Night Cream to rejuvenate. Also available are the Intense Recovery Treatment and Replenishing Eye Therapy. Revaleskin Night Cream was featured in InStyle Magazines “Best Beauty Buys 2009” highlighting that the “silky formula tackles fine lines and age spots … (and) it sinks in twice as fast as most other night creams”. 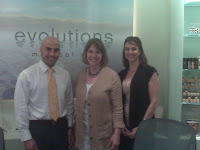 Revaleskin is a skin care line available at Evolutions Medical Spa.